Angel falls, the world’s highest waterfall, might be Venezuela’s most talked about tourist attraction, but the best party you’ll ever have is in the small fishing village of Choroni. The place just throbs with music, from the salsa and reggaeton played in the small beach bars to the thumping drums that set the place alight at night. Russell Maddicks enjoyed a rum-soaked night of tambores on Venezuela’s central coast. With its beautiful crescent beach backed by palms and its sea-wall, or malecon, where you can sit and watch the pelicans diving for fish, Choroni is the place to kick back and get to know Afro-Caribbean Venezuela. We knew we’d come to the right place as soon as we stepped down, rather unsteadily, from the bus. Choroni, also known as Puerto Colombia, is a fishing village on Venezuela’s central coast famed for its drum dancing, or tambores. In colonial times this was a large slave plantation and its geographical isolation has helped to preserve important elements of Afro-Venezuelan culture. The biggest adventure is getting here. It’s about four hours by bus from the capital city of Caracas to Choroni and the road that winds up from the city of Maracay into the cool cloud forest of the Henri Pittier National Park is not for the faint-hearted. The road was built in the 1930s by the dictator Juan Vicente Gomez as an escape route to the sea but nowadays it’s main use is to bring in the excited crew of sunseekers, surf kids and foreign tourists who flock here on Fridays. The hairpin bends are truly hair-raising and the driver is either very expert or has entrusted our lives to the luminous Virgin Mary stuck to the dashboard. While I say a little prayer, he blithely swings the bus round the bends in time to the salsa erotica blaring out of the speakers. Far from being worried by the breakneck pace, my fellow passengers seem happy to sing along. The biggest excitement comes just as we pass the highest point, some 1,800 metres above sea level, when the bus screeches to a sudden, shuddering halt. Everybody gets off to see what’s happened only to find a three-toed sloth in the middle of the road with a little baby sloth on its back. It’s a miracle we didn’t hit it. Perhaps the Virgin is looking down on us after all. Our first stop is at the cute, colonial town of Choroni, set back from the sea as protection from the marauding English pirates that once scoured these coasts for booty. A few kilometers more bring us to Puerto Colombia, right on the sea. It might be early, but music is everywhere. A small stall selling juices is playing reggae, the liquor store is blasting out 80s salsa and there’s a reggaeton fiesta going on at the empanada place where the fishermen are hanging out, drinking beers. There’s a definite Afro-vibe here that is unlike the rest of Venezuela. After a wash and brush up at the cheap and cheerful Posada de los Guanches (less than 10 dollars a night) we set out to explore. It's a five minute walk to the palm-fringed beach, which is framed by high bluffs. The sea is warm and frisky, perfect for body surfing, but with an undertow in some places that is best avoided. 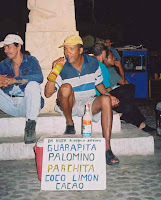 The first friend we make is Palomino, a former life guard who now sells "guarapita" - a sweet-tasting cocktail of passion fruit, cane alcohol and sugar. Palomino also has a less traditional "chocopita", made from cocoa powder, that goes down surprisingly easy. In fact, swinging in the hammock under a palm tree, sipping guarapita and watching the waves lap the sand, its easy to see why everybody seems so laid back. A kid comes past with a bucket on his head. He's selling a dodgy-looking seafood aphrodisiac called "Siete Potencias", or "Seven Powers". It "brings you back to life", he says with a grin. In case we miss the point he says it’s also called "Rompe Colchon", or "Bed Breaker". That night, after a glorious supper of red snapper and fried plantains we head down to the malecon, the sea wall promenade, to catch the dancing. There’s no definite start time. As soon as enough people gather and enough guarapita has been consumed it just kicks off. A couple of kids drag out two large cumaco drums and place them under the statue of Saint John the Baptist. "He's the saint of the blacks, our saint" explains Palomino, who has set up stall on the other side of the statue. Made from a hollowed out avocado trunk, the cumaco is almost two metres long. 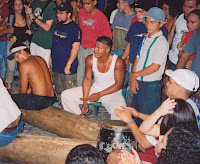 The leather head is played with the hands by a drummer sitting astride the trunk while another one beats out a fast rhythm on the sides with two sticks called palillos or laures. As soon as the first furious beats break out a couple starts to dance and a circle forms around them. This is what we came for and it doesn’t disappoint. Supremely athletic men, dripping with sweat from the exertion, hips moving like a washing machine on fast spin, try to get as close as humanly possible to the woman gyrating in front of them. At any time another dancer, man or woman, can cut in by moving between the two dancers and separating them, so the energy never flags. The crowd eggs them on, clapping and cheering the best dancers and laughing at those with no clue (me I’m afraid). Do this in your local high street and somebody would call the police. Meanwhile a cantor, or singer, steps forward to lead the call-and-response vocals. The song is drowned out by the drums – even louder now with the arrival of three congas – but everybody joins in with the simple chorus of "dale" ("do it"), and for while we are all as one. About four hours later the drums come to a staggering halt as the booze runs out. As they have a whip-round for more rum, we walk to the beach for an exhilarating moonlight dip, the drums a distant echo of an unforgettable night. Okay Russ, nice work on that one....Choroni brings back multiple (mostly female) memories for me..the first one was with two American girls, wherein as soon as I got into town I lost the keys to the rental car, but retrieved them at the amicably staffed local liquor store. Phew. The second or third visit, I was sitting on the Malecon with one of the great loves of my life (it turned out) afraid to join in the tambores dancing for fear of blowing the relationship. "Could you just rub my neck a little," she said to get things started. Then there was the night with another girl who had never sampled a "guarapita" before, and after she did, the terrible mess to clean up in our posada bed an hour or so later. A friend of mine almost drowned at the beach there, but we´ll leave that tale to another posting. Wow, so many memories, Russ. Reading your post transported me to a decade ago, and made my eyes tear up in longing. Choroni is my favorite place in the whole world. So many wonderful trips with friends and lovers. The descent from Maracay into Parque Henri Pittier was always a voyage into a different timeline for me. Living at the frantic pace of Caracas, after an exhausting "trimestre" at Universidad Simon Bolivar, there was nothing like a long weekend in Choroni. With no exact date of return, living off the few bolivares a group of broke college kids could muster. Time ebbs and flows differently on that magic coastal valley, where the rainforest plunges into the caribbean. I can't get into the comments section to change it. Just got back from Choroni. Wow! What a place. Will never forget the sunsets, the drums, the beach or the people. Want to come back again next year for a whole two weeks just in Choroni. Went on your reccommendation, so THANKS A MILLION! Tell me about some other places to visit in Venezuela. Me gustaron tus blogs, tienes mucha informacion del pais !! Congratulations! I was in VZ alone in 2001 and tried to go birding in Henri Pittier. I ended up sharing a cab and a six pack with this woman (I'm female) who was throwing a quincieanera that night and invited me to come to the party instead of stay at a hotel. When the tambores broke out I had no idea what I was looking at, and I actually only figured out the name yesterday. So nice to read your article! !